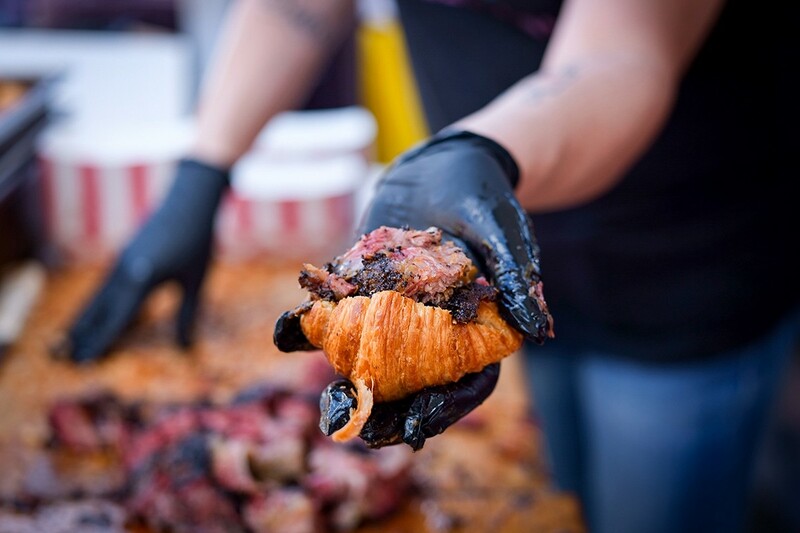 Croissant and beef rib collaboration, courtesy of Louie Mueller Barbecue and Fluff Bake Bar. Photo by Robert Jacob Lerma. Spring is a time of renewal and rejuvenation. For the organizers of the Houston Barbecue Festival, it also means it’s time to roll out the pits and celebrate everything about barbecue. 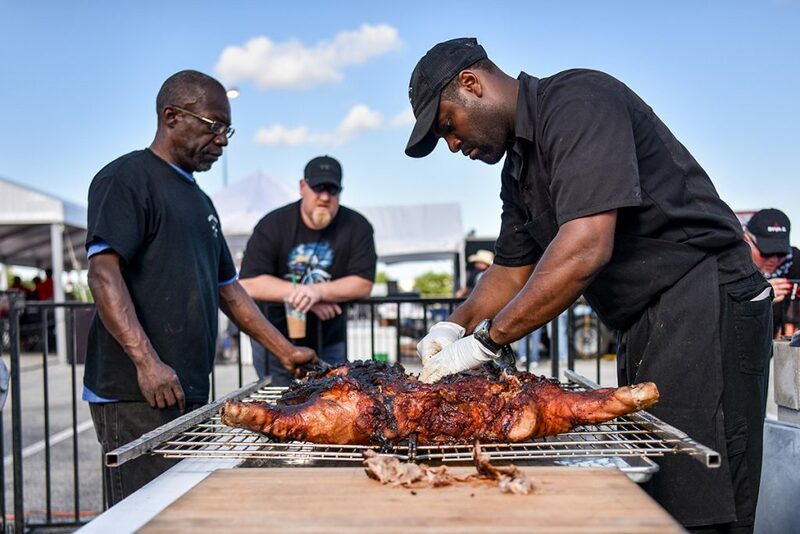 The festival highlights the cooks and pitmasters who contribute to the rich tapestry that embodies the Houston barbecue scene. Attendees of this year’s Houston Barbecue Festival get to taste samples from about 28 restaurants that offer not only traditional favorites but also some of the most unusual and flavorful smoked meat creations in the country. In Texas, brisket is king, but guests can expect to also be able to try lamb, barbacoa, whole hog, specialty housemade sausages, and unique side dishes. 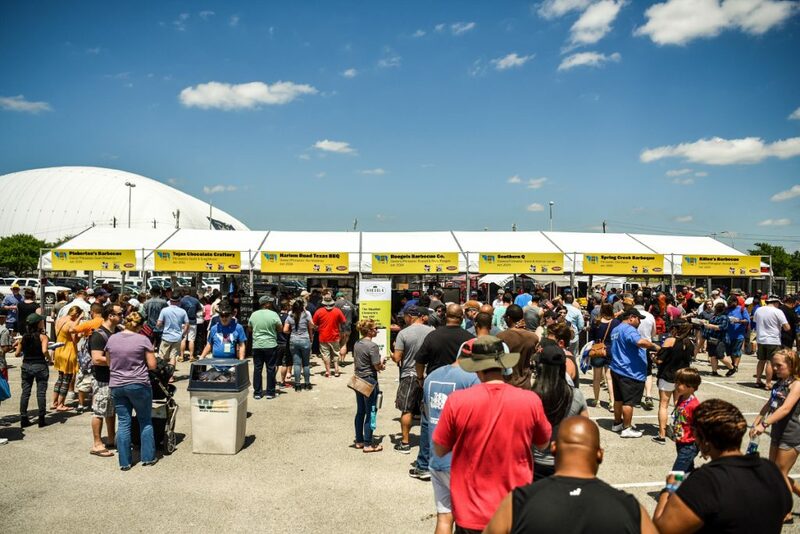 For the first time in its six-year history, the Houston Barbecue Festival is moving to a suburban area northeast of Houston. This year’s festival is being held on April 15 on the grounds of the Humble Civic Center and Arena, a huge complex with acres of parking as well as a large, covered pavilion and open-air arena. 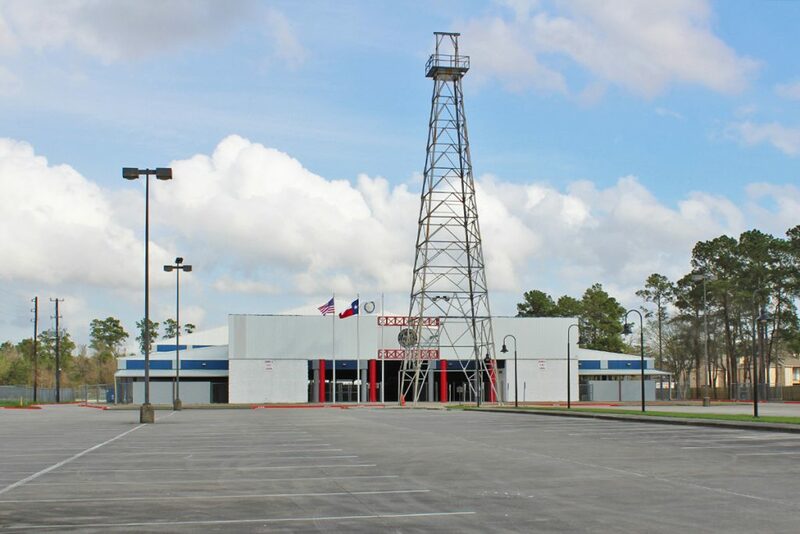 The facilities are located one mile east of US 59/I-69 on Will Clayton Parkway—just south of Humble—and are easy to find. Humble Civic Center Arena, site of the 2018 Houston Barbecue Festival. Photo by Scott Sandlin. The new location provides many benefits for festival attendees, not the least of which is free parking. Patrons won’t have to shell out $10 to park as was the case previously and that means extra money for beverages or other goodies from vendors. The beverage selection is better and the wait to get drinks shorter, too. Local craft beer from Saint Arnold Brewing Company is available for $6, and the number of beverage lines has been significantly increased. The rodeo arena is ideal for live music, and, along with the adjacent pavilion, provides ample covered seating in the event of inclement weather. This year’s event will feature four of the Top 10 Barbecue Joints in Texas as rated by Texas Monthly in 2017, including Tejas Chocolate & Barbecue of Tomball (#6) and CorkScrew BBQ of Spring (#7). Returning for another year is the ever-popular Louie Mueller Barbecue of Taylor, Texas (#5), and new to the lineup for the 2018 festival is the Brenham barbecue powerhouse, Truth Barbeque (#10). Other Houston barbecue joints participating that were honored in the 2017 Texas Monthly Top 50 list include Gatlin’s BBQ, Killen’s Barbecue, Pinkerton’s Barbecue, Roegels Barbecue and The Pit Room. Also returning to the Festival this year is Blake’s BBQ, Blood Bros. BBQ, The Brisket House, El Burro & the Bull, Fainmous BBQ, Feges BBQ, Gerardo’s, Harlem Road Texas BBQ, Jackson Street BBQ, Lenox Bar-B-Que, Pizzitola’s Bar-B-Cue, Ray’s BBQ Shack, Southern Q BBQ, Southside Market & Barbeque, Spring Creek Barbeque, and Tin Roof BBQ. Recently announced newcomers for 2018 include Willow’s Texas BBQ, Buck’s Barbeque, and Victorian’s Barbecue. The final lineup is subject to change. Greg Gatlin of Gatlin’s BBQ preparing whole hog for the 2017 Festival guests. Photo by Robert Jacob Lerma. General admission tickets are available online for a pre-sale discount of $50 each (limited time only), and a few VIP tickets remain for $120. A ticket includes entry into the festival and unlimited sample portions from each of the participating barbecue joints. VIP tickets allow entry an hour earlier (12 noon) and also includes unlimited barbecue samples, plus a festival t-shirt and one free drink ticket. To ensure a quality event for everyone involved, the number of tickets is limited. All will be sold in advance – no tickets are sold at the gate. Children 6 and under are admitted free. No pets are allowed, with the exception of service dogs. Guests enjoying the 2017 festivities. Photo by Robert Jacob Lerma. Humble Civic Center Arena, 8233 Will Clayton Parkway, Humble, TX 77338. Link to tickets. About The Author: Smoked meat enthusiast Scott Sandlin authors the Texas Pit Quest blog, maintains the Guide to Houston-Area BBQ map, and is the freelance barbecue columnist for Houston Food Finder.